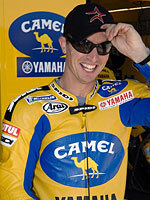 Camel Yamaha Team riders Valentino Rossi and Colin Edwards began their final three days of pre-season testing at Jerez de la Frontera in Southern Spain today. The 4.423 km Jerez circuit, which will play host to the season-opening Grand Prix in two weeks time, provides the last chance for the World Champion and his team-mate to perfect the set-up of their YZR-M1s before the curtain goes up on the new MotoGP season. Following last weekend's test in Barcelona, where Rossi consistently topped the time sheets and Edwards drove away with a new car after winning Sunday's wet qualifying shoot-out, both riders were faced with some traction problems today and are now focused on finding a solution with tyre manufacture Michelin and the Yamaha engineers over the next two days. Loris Capirossi (Ducati) was the only rider to lap under the circuit record, setting a time of 1'40.910. 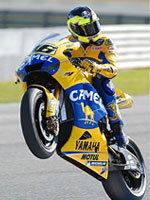 Edwards (1'41.730) and Rossi (1'41.861) set the sixth and ninth best times respectively. "After the highs of last weekend, today has shown us that we still have a bit of work to do before the first race. We started with 99% of the same settings that we had in Barcelona and we've only made some small changes; the bike is still working great. However we're missing traction with the tyres and now we need to get that sorted out with Michelin. We need to find the right tyre for our bike at this track, but they're working hard to do just that and tomorrow we should have something new to try. I think everyone's a bit tested-out now so it's just a case of making one last big effort here, then we can all finally concentrate on the first race!" "It's quite a big change coming here after last weekend as we have some problems and the vibration that we had in Malaysia and Qatar has returned. The problem is that the tyres that we have available to us here are not working correctly with our bike, so now we're waiting for some new race tyres for tomorrow and Sunday. We hope that with this we can fix the problem. We've worked a lot on settings and other things today in order to find a way to improve the traction, but in reality we can't do anything until we have a different tyre. We're ninth so we're not very fast! Now we have just two days to prepare before we come back here for the first race so we're going to work very hard with Yamaha and Michelin to solve the problem." "We had some problems today to make our package work like it did last week in Barcelona, but both riders have the same problem so this make it's easier to work on the situation. We exchanged a lot of information between Yamaha and Michelin and in the next two days we will work together to find the right solution. I am confident that with the full cooperation of everyone involved, we can overcome the problem."